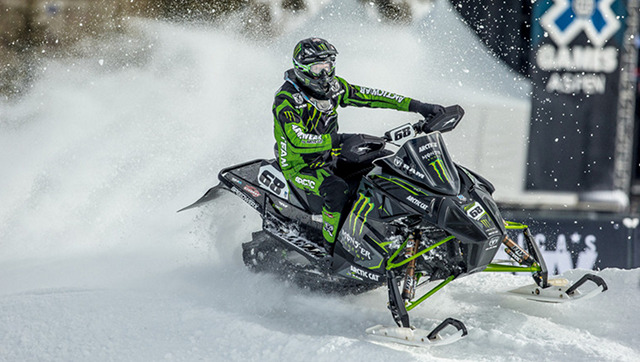 ​You've probably seen snowmobiles, but racing them might be new. 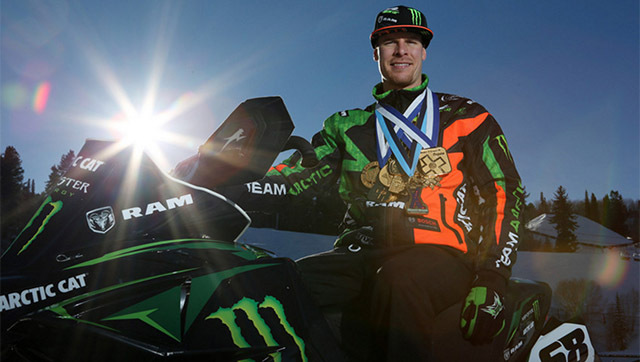 So we talked with Snocross star (and nine-time gold and 13-time X Games medalist) Tucker Hibbert about how he got into the sport, what it’s like to compete in the X Games, and how his sled differs from what you'd ride on the trail. You're first race was at 2 years old. How did you get into racing so young? It was because my dad raced himself, and I just kind of grew up in that whole atmosphere. So obviously when I'm 2 years old, I'm not like... I don't really know what a snowmobile is, but fortunately my dad was into racing and snowmobiles and motorcycles, so he get me started when I was really young and it was something that I fell in love with. And even when I was 2, 3 years I was just super excited about and just couldn't get enough ridings. So it was something I've done since a really young age. With something like a bicycle, there's a learning curve where you learn how to ride on two wheels without falling over. Is there something similar on a snowmobile? How do you learn to ride? With a snowmobile, the machine will stay upright, unlike a bicycle. It pretty much doesn't crash unless you make it crash. But it's no different. You figure out how to ride it, you have to learn how to control the throttle. A tendency people have when they're first learning is they kind of panic and grab the throttle and hold it on and don't stop until they hit something, you know? So that's kind of something you have to learn. And then obviously going too fast and crashing, you hit a bump or a jump or different things. When I started out, when I was 2 years old all the way through probably 4 or maybe 5 years old, I rode a really small snowmobile called an Arctic Cat Kitty Cat, which was the mini snowmobile for little kids. I started riding that thing and managed to roll it over enough times that I broke the hood and windshield more times than my dad wanted to fix it, so he ended up just taking the hood and windshield off so the engine and everything was just kind of exposed so he didn't have to keep replacing all the parts every time I crashed it. For a while, you were the youngest gold medalist at the X Games. What does that do to you, not only as a racer but also the way people like other racers interact with you outside the X Games? Well, I guess it's cool — it was cool — to be the youngest X Games gold medalist for quite a while. I was fortunate to get my first win when I was 15, so it was a really cool experience for me. And I guess being the youngest wasn't necessarily as cool as just having that gold medal and that experience. But last year, Chloe Kim beat me out for that record, which I'm totally fine with. It was never a goal of mine to be the youngest gold medalist, but it was really cool. 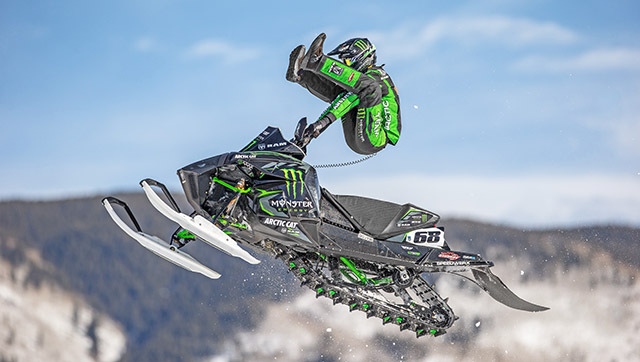 ​​​In terms of what you ride for a snocross event, how does the sled differ from what you would use if you were just riding a snowmobile. They're not much different at all. Obviously, with snowmobiling there's a lot of different types of riding. There's mountain riding, which a lot of people do, they just go out in the backcountry in the mountains and ride just through the woods in the mountains. And then there's trail riding, which is a generally done on a grooved trail that's kind of a marked trail that people would just ride down, kind of sitting down going for a cruise. And then you can do anything in between. A lot of people enjoy hitting jumps and snowdrifts and different things when they're just out recreational riding. So with those kind of variations of riding, there's a lot of different types of snowmobiles. The ones in the mountains are built with longer tracks and deeper lugs on the tracks so they can go in the deep snow. A lot of times bigger engines for more power, compared to, maybe, a trail sled that might have softer suspension and maybe a bigger windshield to keep you warm, some more comfort oriented things on the snowmobile. And then our race snowmobile is kind of in-between those two snowmobiles. It's got more performance-based parts on it, stiffer suspension for taking the big jumps, lighter-weight parts maybe, higher-powered engine parts. Basically the normal stuff that you would see in a racing environment. Racing forces you to get creative and try to get the most performance out of what you're racing. And with snocross, it's no different. We're just doing everything we can to have the best-performing snowmobile, the highest power, less weight, best suspension, all those kind of things. Are there are particular parts of your sled that you focus on to give you the edge over your competitors? Yeah, there's a lot of things that we focus on. Obviously all parts of the snowmobile have to be the best they can be to hopefully have the best snowmobile out there and have the best of chance of winning a race. Some of the main things, though, that we focus on probably the most would be the suspension, front and rear suspension. With different race tracks, we go from one track to another and it might be a lot smaller jumps or bigger jumps or maybe flat corners and it takes a different suspension setup for each race. So we're always tuning and changing our suspension to make the snowmobile do what we want on different race tracks. So that's a big thing we look at. And then one of the other things is the clutching. They have clutches on the snowmobile that are kind of an automatic type clutch, but you can tune them and we do that a lot. Mostly, with the clutch tuning, we're working on trying to get a better start right at the beginning of the race to try to get out front early, ahead of the other guys. How about in terms of the engine? Is there a race engine that you then modify? Or do you take a standard snowmobile engine and modify it to how you want it? The engine we use is built specifically for racing, and the rules that we have, we can't modify the engine very much at all. It's pretty limited. So, we're not able to do a ton of modifying. But we can change the exhaust, so we do a lot of work on the exhaust system of the engine to make its performance as good as it can, and then we change the tuning of the carburetors to work at different elevations and different temperatures. You can gain and lose a lot of performance in carburetor tuning. We do change them. It's called the track, and we don't have a lot of different patterns. They're called lugs on the track, and they have different profiles and patterns and stuff. But we can switch from maybe three different patterns, and we do change those depending on the snow conditions. If it's icy or if the snow is really loose, we'll sometimes use a different track. And then we also add studs to the track. We drill holes in the track and put in metal studs that are about almost two inches long, and they help a lot with traction when it's icy. So that's a huge advantage if you have the right amount of studs or the right kind in the right places, they can help you a lot with traction. ​​Do you do anything to the exterior body of what you ride in a race to make it lighter or more aerodynamic than, say, a trail snowmobile? We definitely try to keep it as minimal as possible. We don't have any parts on the snowmobile that aren't necessary. So, we remove some things and we modify parts and lighten parts up and also, for sure, we're trying to keep it aerodynamic and as small as possible so it isn't any bigger than it has to be. All those things. I grew up in western Pennsylvania where we have some skiing and snowboarding, but not a lot of snowmobiling — certainly not racing, or not very much. So it's interesting to learn more about snowmobiling as a sport, not just a recreational activity. Snowmobiling is a really cool sport in that anyone can do it. You see grandma and grandpa out for a cruise on some of those touring snowmobiles, just putzing down the trail, maybe only going 15 or 20 mph. And maybe they've got their grandkids with them. And then you've got a 20-year-old kid who wants to go super fast and he gets a high-performance snowmobile and he's out hitting jumps and having a fun time with his buddies. And anything in between. It's really a sport anyone can do. What advice would you give to a kid who watches the X Games and maybe is being exposed to snowmobiling for the first time and thinks, "That's really cool. I want to do what Tucker does"? Well, I would encourage them to try it out because it is a ton of fun. It's a super fun sport, like I said, that the whole family can be involved in, whether you're going to the races as a family or just trail riding and enjoying the sport as a family. It's a lot of fun. And you never know if you're going to like it or be good at it unless you try. So, just go out and try it and have fun. And for those who want to race and be competitive, it's just like any other sport or activity you want to succeed at: you have to work extremely hard and practice a lot and sacrifice other things if you want to succeed at it. So it's just a matter of getting out there and doing it and having fun and working hard. Is there a progression? Should a kid start of on, like, a trail sled and then work their way up? What advice would you give in that regard? Yeah, for sure, you want to start out just riding a snowmobile on a trail or out in the fields or somewhere, not going straight to a track and trying to hit jumps and all that right away. If that's something you want to do, you need to work into that and work your way up. But just getting a feel for riding a snowmobile and figuring out how it reacts and how to ride it and keep it in control and slowly working your way into jumps and bumps and corners and eventually go to the track and start riding on an actual track. It's definitely something you don't want to... You don't want to just go right to the track and hit the biggest jump you can find because it's not super easy. It takes some getting used to and some practice.